Residents and business owners of Cherry Hill, NJ! Floor Skinz would like to introduce itself to you! Floor Skinz is a residential and commercial concrete floor coating company! We will help protect and enhance the beauty of any and all of your concrete floors. 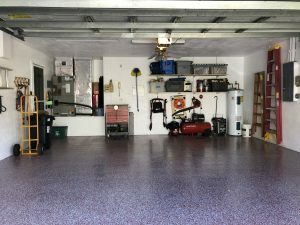 The most common floor that we coat is the garage floor. Our floors are perfect for garages because unlike DIY epoxy kits, our floors will not chip or peal when placed in direct contact with heat or friction that comes from car tires. 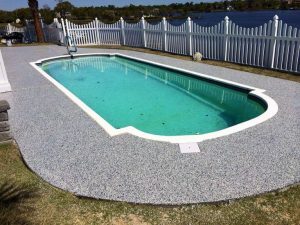 Our floors are very durable and are even waterproof, so they can even be used on pool decks! Check out our complete list of floor systems below! Contact us today for a FREE quote! 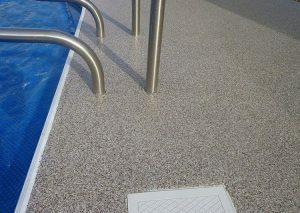 Epoxy chip floor pool deck! Epoxy chip floor in a residential garage!